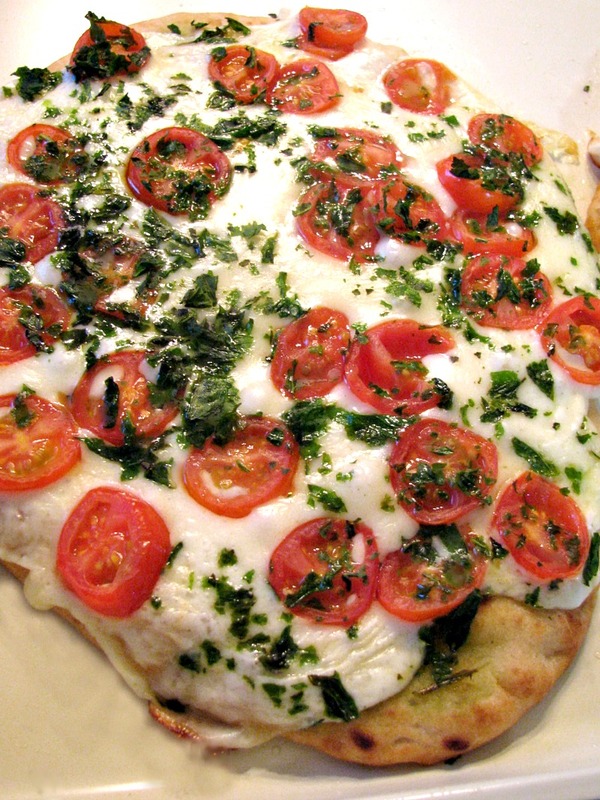 Naan flatbread topped with mozzarella cheese slices, sweet cherry tomatoes, basil, and olive oil. This Margherita Naan Pizza is incredibly easy to make and ready in about 20 minutes. The weather has been all over the place this winter and beginning of spring. The only thing we haven’t had here in Northeast PA is snow, we had a total of three inches! Not that I’m complaining, I’m always ready for summer weather. Every Mother’s Day we plant our garden, and that includes lots of regular and cherry tomatoes. 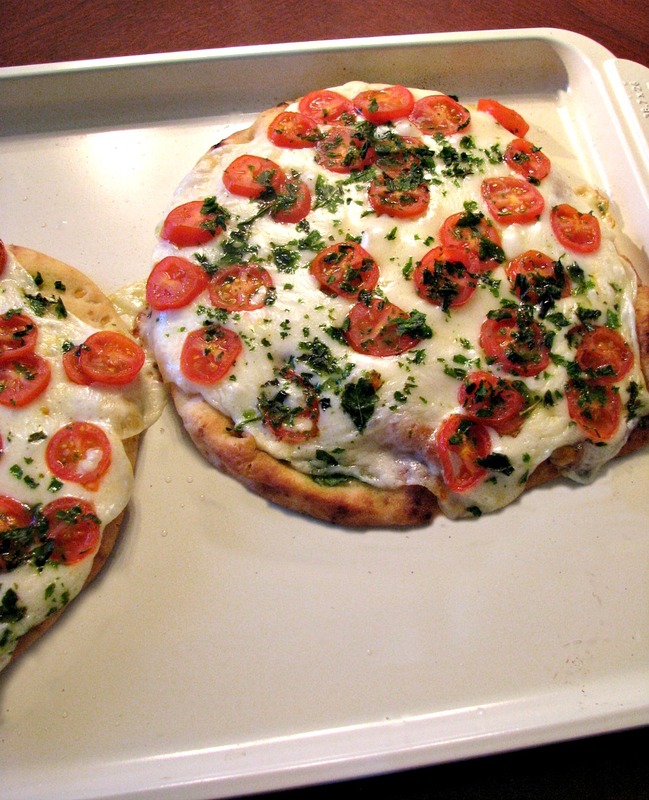 This Margherita Naan Bread Pizza would be fabulous with fresh from the garden tomatoes! While I do try to eat seasonally as much as possible, the one thing I can’t live without is tomatoes. I try to find ones at least grown in the U.S. at the grocery store, but even that is sometimes impossible. A few weeks ago I really wanted to make a margherita pizza recipe, and I had garlic naan bread plus everything I needed for this naan pizza recipe. These are so easy to make, the only real work is slicing the cherry tomatoes. Even that only takes a few minutes. It’s great for dinner on a busy night, or when you just want something cheesy, fresh, and delicious! I love making pizza at home, and have tried many different recipes over the years. 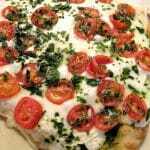 This Margherita Naan Pizza is definitely a summertime favorite! You might be seeing a lot more quick or slow cooker recipes here. I’m babysitting again, and there is something about my 6-year-old, a 21-month-old, and a 6 week old that make me think that more complicated meals may be impossible! I’ll save those for the days I’m not babysitting. Preheat the oven to 400 degrees F. Place the naan flat breads on a baking sheet and brush each one with a tablespoon of olive oil. Bake in the preheated oven for 3 minutes. Top each flat bread with half of the mozzarella cheese, then the sliced cherry tomatoes, basil, and finally drizzle each with the remaining olive oil. Bake for 7-10 minutes, or until the cheese is melted. Made this on our anniversary night as we had a date night in!! My wife loved this a lot, so much that this is now on our to go list when we have our friends & family come over! Simplicity of this recipe makes it an absolute winner! Thanks so much for sharing !!!! Hi Tanmay, great! I’m so glad you both like it. This is pizza is SO delicious and (even better) EASY! I’m obsessed with Naan flatbread and could eat a variation on pizza a couple times a week. Tonight I was tempted to order in but decided to save money and see what was in the house – which wasn’t much. I only had shredded skim mozz, but it substituted just fine.